Warwick Mechanical Contracting specializes in HVAC, piping and plumbing systems for large commercial buildings, hospitals, hotels, schools, government facilities, and special use structures. Our project managers, engineers and estimators have decades of experience building the largest and most complex projects in Virginia. Our team has consistently tackled the most challenging projects, delivering on time and on budget results. 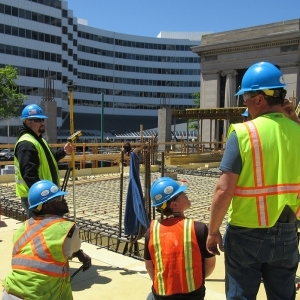 Fast Track: The design-build method is ideal for fast track construction projects. Our team of licensed engineers can select and lay out system types early on to significantly reduce the amount of time spent generating construction documents. Reduced Risk: At Warwick, we take responsibility for our designed projects. This means we do everything in our power to design and deliver a project that exceeds the customer’s expectations. General Contractors and Owners can limit their risk by partnering with Warwick Mechanical early in the project. Design Team Collaboration: When contractors and designers work together on a project, we can generate exceptional cost-effective solutions for any level of system and customer. Design Assist: Our team of engineers can work with the project designers to provide cost control and value engineering input throughout the design phase. We excel at finding unique solutions to meet the owners’ needs while keeping the project within budget.Over the years we have saved our customers millions of dollars simply by anticipating construction problems and ensuring we get the best possible HVAC equipment pricing. Performance Contracting: Our team stays up to date with the latest in energy efficient HVAC solutions. We can develop a construction budget that includes the savings from the new equipment to allow for greater flexibility on projects. Plan & Spec: Warwick’s experienced estimating staff can provide very accurate costs for fix-price bid projects. Our skilled project management team can identify cost savings through the Value Engineering process as well as potential construction issues to save money and avoid schedule problems. Integrated Project Delivery: This delivery approach takes design-build a step further in creating a cohesive project team. By sharing responsibility for the project’s budget and schedule, cooperation and collaboration are maximized within the team of designers and contractors. The result is a project delivered on time, within budget, and often for less cost than traditional methods. Expertise and Experience: With over 60 years of the most skilled and experienced staff at Warwick, you are sure to get the very best technical advice during the design process. Safety: Safety is Mandatory at Warwick. We utilize a full time Safety Department to continually monitor our projects and to keep in compliance of all OSHA standards. Project and Engineering Team: We have the most talented and experienced Project Management Staff in the region, backed by In-House Field Technicians that are committed to excellence in quality and craftsmanship. Satisfaction Guarantee: Our success of over 60 years is a result of quality of work and our ability to create long-long term relationships with our clients. We stand behind each and every project that carries the Warwick Name with pride. If you’re looking to build a rewarding career in a well-established, innovative company that puts client service first, Warwick Mechanical Group may just be the place for you.